Miller-Keystone Blood Center is teaming up with Lehigh and Northampton County High Schools to save more lives in our community! 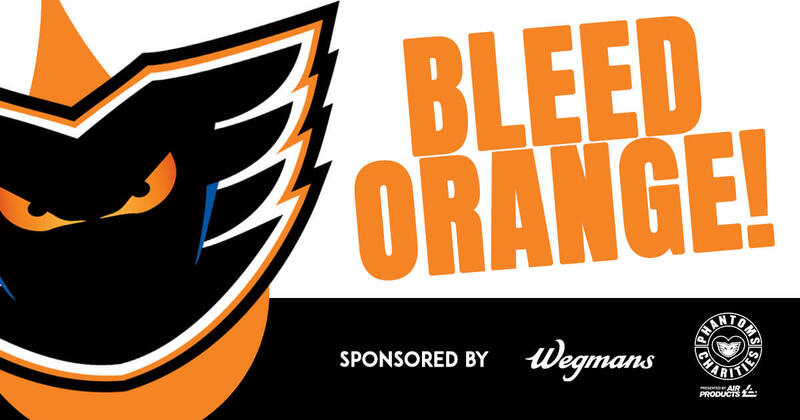 In partnership with Phantoms Charities presented by Air Products, Miller-Keystone Blood Center presents the BLEED ORANGE High School Donor Recruitment Program sponsored by Wegmans. This collaboration with Phantoms Charities and Wegmans is designed to engage and educate young, high school student blood donors and increase donations to save more lives in our local hospitals. Featuring exclusive Ticket & T-shirt giveaways all-season long, plus meLVin Meet-and-Greets for the Top 3 High Schools, BLEED ORANGE aims to motivate students to support our life-saving mission by donating blood. Together we can collect 250 additional units this year – that’s up to 750 lives saved! Keep your eyes peeled for your school’s next Blood Drive and sign-up to donate.